It is easy to look at structured play and believe how good it is for kids. We can see value there. We seem to be discrediting the value of free play, however. Our society is decidedly moving further and further from giving children time for free play. Kindergarten used to be heavy on the playtime. Now they are lucky to get 15 minutes of free play in the morning and 15 minutes in the afternoon. We must, after all, be sure they are ready to write their first novel before the enter the first grade (sarcasm alert). This is not the fault of teachers but rather the result of curriculum requirements. Schools aren’t the only ones to blame for the lack of free play in the lives of our children. We parents hold just as much, if not more, blame. In general, we feel like by age 7, the child better have decided what it is he/she wants to focus extra curricular focus on. No later than 8, we will be trying out for comp teams, super leagues, or signing up for intense training. We schedule their days so that time to just play is a rare thing indeed. If neither school nor over-scheduling activities is taking up free play time, there is a good chance media is. A recent statistic I read was that the average child is spending 53 hours a week with media. 53 HOURS! That is a full time job. This post contains affiliate links. NurtureShock, by Po Bronson and Ashley Merryman, shares that “pretend play is the way kids master symbolic representation, which soon becomes necessary for all academic coursework” (page 237). Children are different than adults. For adults, free play time is a time we relax. It is how we have fun and socialize. That isn’t what free play is all about for kids. 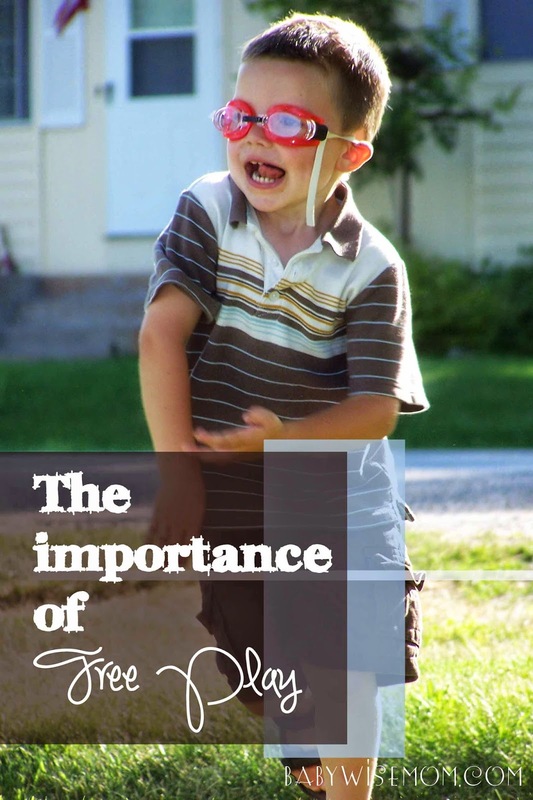 Yes, it is fun, and yes, social skills are practiced and learned, but it is more than that. It helps them make sense of the world. As you are planning your day, be sure you have time in there for your child to just play. Encourage your child to use her imagination. Schedule in that structured play. Absolutely do some extra curricular activities outside the home. It won’t hurt to have some time scheduled to allow for media. But be sure that there is time for free play as well. We have some rules in our home. These won’t all be standards that work for you, but they work for us and they can help give you an idea as you brainstorm how to balance your life. I don’t allow TV time every day for anyone except Brinley–age 2.5 (well, 5 days; we only watch TV on Sunday if is a family activity and we rarely watch TV on Saturdays). Brinley gets more time because she has more time on her hands each day. Video games are allowed 3 days a week. Time spent is 1-2 hours each of those days. When the kids are in the school year, Saturday is largely a day of free play. During a few months, there will be a couple of basketball games some soccer games each Saturday. We might have some chores to catch upon (but we try to get those all done during the week if possible). As much as is reasonable and possible, Saturday is a free play day. For us, pretty much all time spent after dinner and before bed is free time. We do chores and practice piano before school. Homework is done first thing when they get home from school. My school-aged kids get a lot of structured time during the day at school. I want to be sure there is a balance of free time in their day and that will mostly happen at home. Brayden, at age 9, is involved on a competitive team (swim team). We want to make sure he still has free time in life and that he won’t get burnt out and hate swim team. If he wants to, he is allowed to take one practice off each week. He only competes in one swim meet a month. Could we push him and he would be a more competitive swimmer at the moment? Definitely. He could swim more often and do meets more often and be further along than he is. But what would the purpose be? And how long before he decided he hated swimming and wanted to quit? And would he have time to play with his siblings and his friends? I do my best to schedule extra curricular activities to be done before dinner time. My girls have dance, but it is over by 5:15 on their dance days. The same is true for dance and gymnastics classes. I also try to double up on those activities. For example, McKenna has gymnastics from 4-5 and Kaitlyn has dance from 4:15-5:15 on the same day of the week. This makes it so our travel time to and from activities is less than it would be if we were traveling for them separately. That means kids can have their activities and we can still have free time in the day. As fun as it sounds, do not sign your child up for everything. This sounds easy and “duh” when your kids are younger, but as your kids get older, it is hard! Your child might have super talent in one area–you might want to have your child learn 3 instruments at once (or your child might want to). You might feel like your child is too athletic for just 1 competitive sports team and you will sign up for several. Or your child might have a lot of interests and want to try some of everything. We live in a rich world with a multitude of possibilities. We can do so many things. Parades kill me because I see all of these fun activities kids can do and there isn’t enough time for it all. Different children can handle different amounts (I have a child who hates to be busy and a child who loves it). Just make sure you have time for your child to just play and be a child. I try to make sure our normal schedule allows for dinner together each day. Trying to follow this just naturally opens up our evenings for more free play for the kids. As my kids get older, the time spent at home is less and less structured and more and more free. I am not saying it is free for all, do whatever you want to at all times when they are home. They have responsibilities. They have chores. They get homework done. They clean up after themselves. But as I said earlier, time at school is highly structured. And remember, free play can have instruction with it. You can say, “Play in this room” or “Play in the backyard” for example. There can still be rules, requirements, limitations, and guidelines on free play. Remember, free play is more than just being about “fun” and socializing. It isn’t just relaxing for your child. It actually benefits your child developmentally. Make room for free time in your child’s life. Thank you for writing this blog. It has been a huge help as a first time mother. I have read over several posts trying to find a solution to my problem. My 19 mo old wakes at 6:15 am but I would like for her to wake at 7. She is down to one nap at 12:30 and we do bath at 6:30 bed at 7:30. We were doing bed at 7 but I moved it back thinking she may sleep later in the morning. (It didn't help.) I really don't want to keep her up til 8pm but really would like her to sleep til 7 am. When she wakes at 6:15, I leave her til 7am. Most mornings she talks and plays. Sometimes she calls us. I'm at a loss on what to do, should I deal with it or make changes to her schedule. Thanks in advance for your help! The time change is in a few days, so what is now 6:15 will be 7:15. I would just keep your same schedule and slowly move bedtimeBack by 15 minutes every few days and see if you can get her sleeping in later while going to bed earlier. I have slowly come to realise that free play is so important. My daughter and I would go out everyday as much as possible to keep her and I entertained. She disliked playing on her own. But then I realised I wasn't giving her the opportunity to try. When she first started she got bored within minutes and wanted me to play. I gradually encouraged her to play and be creative. She has gotten so much better at playing. And I am happier too. Its exhausting going out all the time!! for us both!! Now i actually schedule time for us to stay home and play. Thanks for sharing John! I love your thoughts here. Thank you, Valerie! I appreciate your advise and look forward to trying it out. Love your blog. It helps me so much in so many ways. Bought my steam mop for one… I feel like if I saw you in person I would totally be star struck!